Scholarship for Students of Printing Winkowski company announced the decision of its American shareholder, Quad/Graphics to establish a scholarship for two students from Polish technical printing colleges in the academic year 2004/2005. It will cover one year of studies in the United States (beginning August 2004). Three candidates are to be chosen at each of the schools in Warsaw, Lodz and Szczecin, who will then be invited for an interview at the Winkowski company. The committee evaluating the students will be comprised of representatives of those schools, representatives of the Winkowski company and of the Poligrafika magazine. Final results will be announced on the 26th of May this year. Printing Forum This yearŐs Taropak fair (September 21st-24th) will be accompanied by a Printing Forum Đ a series of meetings devoted to packaging production. It will begin with the 2nd Printing Conference entitled ăPrinting in packaging production Đ development trends and ways to successÓ organised by the Polish Chamber of Printing. Other events planned include the Narrow Web Forum, co-organised by Akzo Nobel Inks, Avery Dennison, Heidelberg and Poligrafika, and the ăPakosfera-packaging from A to ZÓ workshop, as well as an exhibition presenting the offer of the printing industry for the packaging manufacturers. 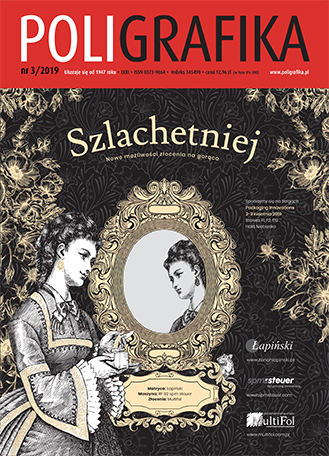 French Printers Discover Poland The French trade magazine, Caractřre features a story about the visit to Poland of a group of 25 representatives of the French printing industry (see photo), which took place at the end of last year. The visit was organised as a result of Heidelberg FranceŐs initiative being a part of the Heidelberg Community programme. During the 4-day stay, the French had an opportunity to visit five printing houses: Perfekt, Cezar, Winkowski, Lotos and SNN Poligrafia, and also participated in a conference attended by local authorities, bank representatives and French entrepreneurs running businesses in Poland. Innovate Đ First Time in Poland The annual Innovate exhibition, organised by Xerox in a number of countries, was held in Poland from March 3rd-5th this year for the first time. The event was hosted by Xerox Polska and its partners, including: Xteam, Reprograf, Riset, Epcot Polska and Softex Data. The highlight of Innovate 2004 were the premieres of the Xerox company: black-and-white digital copiers-printers DocuTech 100 and 120, employing the SmartPress technology, so far used in the iGen3 machine; the colour digital press DocuColor 6060 and the black-and-white copier-printer Xerox 2101. In addition to the exhibition, there were presentations prepared by individual companies participating in the event. Digital Printing in the Institute of Printing ăDigital printing Đ current technologies and possibilitiesÓ was the theme of the conference organised at the Institute of Printing, Warsaw University of Technology by its students with the assistance of the PrintersŐ Section of SIMP and Poligrafika. The invited representatives of Oc Poland, Digiprint and Xteam presented current solutions in digital printing employed in Oc, HP Indigo and Xerox machines. Also discussed were the most commonly used technologies of digital printing. The presentation part was followed by a discussion of the results of tests and measurements done on sample prints run on the machines previously presented. Proofing Đ Myths and Facts A symposium under this title organised by Agfa Sp. z o.o. was held at the Institute of Printing, Warsaw University of Technology on the 4th of March. At the start of the symposium, the GM of the Agfa Sp. z o.o. graphic systems department, Stefan Piotrowski, presented the situation of proofing on the Polish and the world markets. Then, Pre-sales/Product Manager at Agfa, Jacek Hamerlinski, presented AgfaŐs new solutions in the field of digital proo-fing, paying special attention to the GrandSherpa Universal system. A presentation of the Sherpa 24m proofing system ended the meeting. Digiprint Becomes Distributor for Esko-Graphics On the 1st of March this year, Digiprint announced having signed an agreement with Esko-Graphics making it the general distributor of Esko-GraphicsŐ products on the Polish market. Its full line of products is now included in DigiprintŐs portfolio. Thus Digiprint decided on specialisation in design and printing in packaging. DM System, which had been selling Esko-GraphicsŐ products in Poland, will now cooperate with Digiprint as its authorised dealer. 3rd Flexographic Forum A Flexographic Forum was organised for the third time by the Polish Association of Flexographers and was held in Warsaw on March 11th and 12th. The following subjects were discussed: standardisation in flexographic production, new solutions in the area of anilox rollers, colour management, improvement of quality of flexo printing. Speeches were given by representatives of Warsaw and Lodz Universities of Technology and the following companies: Barmey, Rossini, Grafikus, Biffebi, GretagMacbeth, 3M, Sniezka S.A., Infosystems and others. The Forum was accompanied by an exhibition, where products awarded in the Grand Flexography Prize contest were presented. Among the finalists were: Kappa Gdansk, Chespa, Kossacki-Pack, TSP, Bahpol and Baad. Ferag 10 Years in Poland Ferag organised an event to cele-brate the 10th anniversary of its Polish branch. It was held on the 3rd of March in Warsaw. The guests were officially greeted by Maria Paczos, ex-President of the Polish branch of Ferag, associated with the company from the beginning of its operation and Jacek Bucholc (phot. below), the present President of Ferag Polska. Thomas Klumpp (WRH Marketing) and Christoph Schmid, Sales Director for Middle-Eastern Europe, both representing the mother company, expressed their appreciation and thanked the employees of the Polish branch stressing the importance of the Polish market, where the newest Ferag machines are working in the printing houses of, among others: Agora, Media Express and Drukarnia Prasowa in Lodz. Jacek Bucholc was officially welcomed in the position of President of Ferag Polska; he had, in fact, been in the position since January 30th, 2004. ăJapanese CoalitionÓ A seminar, jointly organised by: Reprograf, representing a Japanese company Screen, and Dyskret, representa-tive of another Japanese firm, Toray, was held at the seat of Reprograf in Warsaw on March 11th. The seminar was devoted to Toray waterless offset plates and to Screen platesetting technology. Jolanta Kurowiak, President of Reprograf and Piotr Lunkiewicz, President of Dyskret (both on the photo above) share the opinion that the products of Toray and Screen compliment each other and together form a technological line for the making of printing plates for waterless offset. AmcorŐs Anniversary The 10th anniversary of Amcor Polska was celebrated in Lodz, on February 26th, 2004. Its beginnings go back to 1993, when the Swiss company Rentsch, one of the biggest European manufacturers of packaging for the tobacco, food and cosmetics industries acquired the Pol-Graf printing house in Lodz, then under liquidation. Production of cigarette packaging with the use of offset technology started there alrea-dy in April 1994 and the gravure department, the first in Poland to apply this technology in production of hard boxes for cigarettes, started operating in May. In 1995, the European company was overtaken by an international corporation, Amcor and on April 1st, 1999, Rentsch Polska changed its name to Amcor Polska. At present, the company employs over 200 persons, and is managed by Cezary Wojciechowski. It prints packaging, especially for cigarettes, using the gravure and offset technologies. Alfa Systems Converting Centre in Wroclaw The official opening of Alfa Systems Converting Centre took place in Wroclaw on March 4th this year. The centre offers foil, web and paper converting services (sheeting, cutting, rolling and formatting) as well as technical support services. Machines operating in the centre had been transported there directly from a production line in Holland. Alfa Systems specialises in the production of polyurethane systems and saturated polyesters; it holds the lea-ding position in Poland and takes one of the top ranking positions in Middle Europe. It also represents the General Electric Plastics corporation in the field of Lexan policarbonate plates and foils distribution and formatting. It is also among the leaders on the Polish market in foils and tapes for the printing, advertising and electronic industries.